OneDotZero is an international moving image festival, showcasing a variety of work from innovators across the globe. For this year's festival in London, September 9-13, Wieden+Kennedy UK, together with generative artist Karsten Schmidt, were responsible for all the identity and branding efforts. 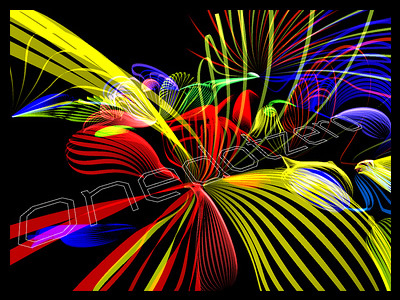 For this purpose, Schmidt authored a generative engine for producing a series of randomized visual systems, which were recorded for use in the trailer and festival posters. The results were astounding. From the OneDotZero website: "The heart of onedotzero's festival ethos of 'convergence and collaboration' inspired W+K to take advantage of onedotzero's vast fan base and harnessing and bringing together constant, global live conversations from a diverse range of social networking to create the identity. Aggregated words and opinions are channelled via specially created software devised by computation designer Karsten Schmidt. 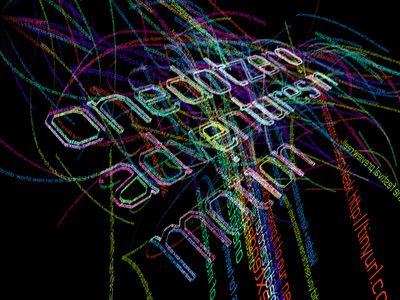 Colourful strands behave organically, gravitating towards invisible paths that will ultimately make the onedotzero logo. A living, breathing identity driven by onedotzero's audience and online community as well as in person at the southbank. A huge projection on the national theatre, lets you interact with the visuals via handset, sms and online message." You can see Schmidt's flickr set, documenting many of the sketches, prototypes and outputs for the project, or check two videos of the initiative on Vimeo (video 01, video 02).